How AI and VI are Reinventing Mobile App Development? The smartphone users have grown at a rapid pace in the last decade, which has pushed business owners to shift their focus from websites to mobile apps. Statistics suggest that mobile app market will start generating revenue of around 189 billion US Dollars by the year 2020. To offer more to this ever growing market, there are technological advancements in the form of Artificial Intelligence (AI) and Virtual Intelligence (VI). Before discussing how AI and VI are reinventing the world of Mobile App Development, we must be aware of what these terms actually mean. Let’s find out! What are Artificial Intelligence and Virtual Intelligence? Basically, Artificial Intelligence and Virtual Intelligence are two sides of one coin. Artificial Intelligence or AI is a human-made machine which is self-aware, goal oriented and can take the decisions on its own. The possibilities and scope of AI are unlimited with the ever advancing world of technologies. However, with respect to the mobile apps, it is being used majorly in Chatbots. On the other hand, Virtual Intelligence or VI is a technology which uses smart programming and is used to assist the humans. These machines are intelligent but what differs them from AI is the absence of their self-awareness. 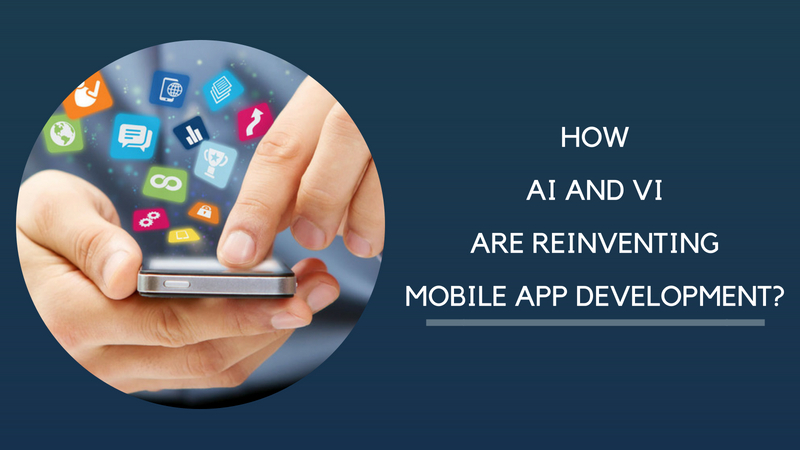 How can Mobile App Developers use AI and VI to Increase User Interaction? IoT, in itself, is among the few latest technologies which are gaining popularity across the globe due to the features they offer. In order to make things convenient for the users, all the electronic devices can have a voice interface, but providing individual support for each of them would not be feasible. To counter this issue, AI and VI can provide a common voice interface for ease of operation and control of all the devices. Mobile Apps using AI or VI can help you preserve your customers by reaching out to them on a regular basis. Moreover, the customers can be contacted in a personalized manner after analyzing their previous interactive sessions. This active communication with the customers not only helps you understand their requirements better but also builds their association with the brand stronger. Whereas, the applications which miss out on the features mentioned above tend to lose more customers. A large number of retailers are ready to integrate the latest technologies for client retention. As AI and VI are providing results in retaining the client, business owners are willing to take a step forward. An AI or VI integrated mobile app can follow the users’ trends and understand the requirements of the customers to provide them with the solutions accordingly. To stay alive in the competitive market, entrepreneurs are willing to adopt the latest trends like AI and VI for better results. With the help of AI or VI, the credit/debit card patterns can be detected, based on the previous transactions. This way, the user does not have to worry about the various transactions done. These apps would not only make things easy for the customer but would also help in preventing any suspicious attempt of payment. If the client feels secure with the application, he/she will undoubtedly remain associated with it. The advancement in the field of technology has made companies opt for AI and VI mobile applications for their businesses. There is a wide range of functions that an intelligent app can perform for you and help you improve your brand’s productivity. It can generate the latest updates on market trends, provide you with the valuable data regarding your competition, prepare comparison charts and analysis of your firm’s performance, etc. Are the Apps Integrated with AI and VI Successful? Artificial and Virtual Intelligence is not a new concept. A lot of age-old apps have been built on this technology, but we are so familiar with them now that we don’t recognize they embody AI/VI integration. From stock trading to medical diagnosis and robot control, everything was once a part of AI and VI. The prime motive of having a mobile app based on AI or VI is client satisfaction. Moreover, it can be determined that the services offered by this latest technology are enough to consolidate the company’s position and make the user contented. After analyzing the latest market trends, it is quite open-and-shut that the future belongs to Artificial Intelligence and Virtual Intelligence. Most of the renowned brands are investing their time, money and resources on this technology. Tech giants like Google, Apple, and Microsoft, are building their state-of-the-art interactive software based on AI/VI. The trust of these established companies in the technology is a proof of how efficiently AI and VI can be if used correctly for client retention, user interaction, and growth. As we would grow older, we hope to see a better world of mobile apps supported by the latest trends and technologies like AI and VI. "There are no words that can express how happy I'm with Skylark Infotech and the crew; they really mean it when they said Appearance is everything! My website it's exactly what I ask for, they are THE BEST. I love the way the pictures zoom in and out." Skylark Infotech have taken our business to the next level. Their professional solutions continue to impress us and their knowledge has catapulted our sales. They have created 4 different websites for our companies; all with excellent results. I will sure use them for all my upcoming projects and recommend them !! The quick turnaround, constant interaction, and high level of customer services of Skylark – mobile application development company are commendable. I am impressed with the caliber of the employees. They better understood my business needs and used powerful strategies to strengthen my online recognition. I would happily recommend Skylark for your IT projects. At present, the websites have become a door of opportunity, and business contacts. Even more so if there is high competition in this increasingly demanding market. In our case is very important to potential customers can stay informed of our services. I enjoyed very much your work, the expectations were met in a comprehensive manner in time and cost that I found very suitable. The site development has raised the prestige of my association and communication has been strengthened both locally and nationally."